What's The Best Superhero Vehicle? Super heroes keep the world safe with martial arts, exorbitant amounts of money, and sometimes weird physical deformities caused by radioactive mutation. But even those guys gotta get around somehow. What super hero vehicles have been the best ever? Even Spiderman had a form of transport, besides those sticky white ropes he squirts out and rides on. 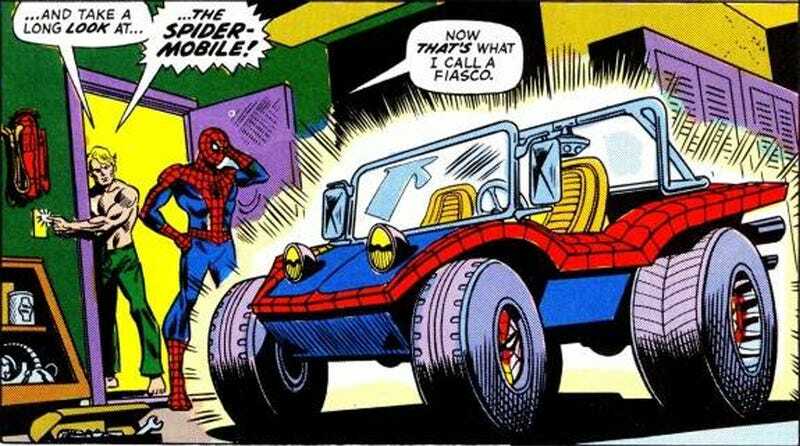 The Spider-Mobile, a short-lived feature of the comic, was this kickass dune buggy pictured above. Apparently it ended up at the bottom of the Hudson River and obviously, it never made it into any of the movies. Comic Vine author Tony Guerrero has a little more backstory on the Spider-Mobile right here... and with that, it’s time to share your favorites!